Peppa Pig has been a popular figure in my house since 2011. Gracie loved Peppa as soon as she could understand what was on the television and I even have a cute video I found recently of Gracie at around 20 months singing her own version of the theme song (cutest video ever). Now Elsie is almost 2 and is probably Peppa's biggest fan, she has even mimicked the temper tantrums like her idol (not so cute). 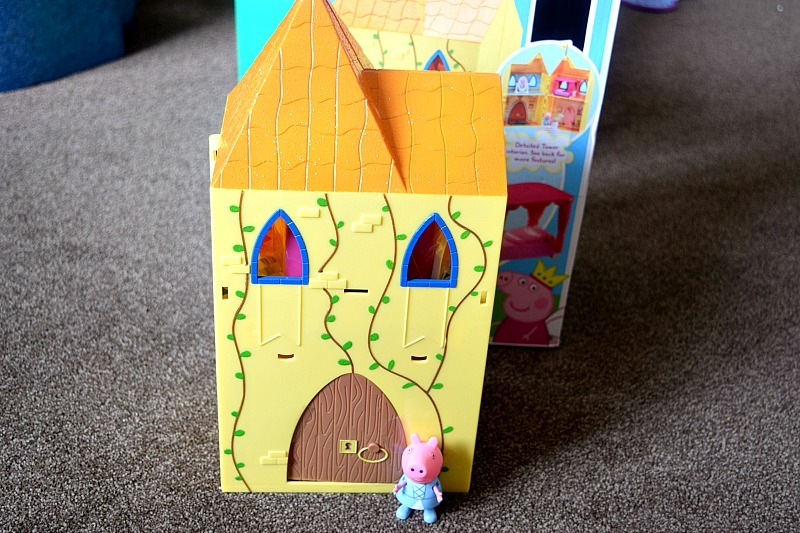 So basically I have a house full of little Peppa fans and so all three of them were happy to be sent the Peppa Pig Enchanted Castle Playset to review. 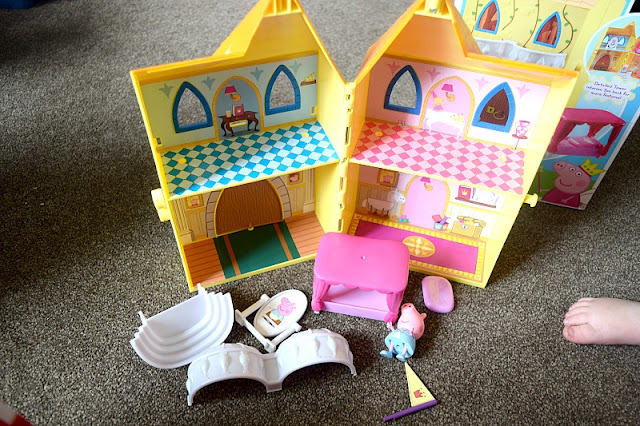 The enchanted castle play set allows your child to create their own royal princess stories and consists of; two balconies which attach to the front of the castle, Peppa Pig princess figure, ballroom steps, flag, magic mirror and princess bed accessories. 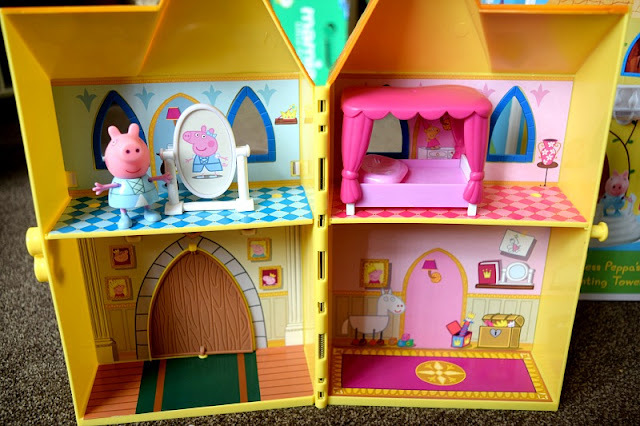 The kids love the castle play set, they like the double sided mirror with a picture of Peppa in rags on one side and a ball gown on the other, just like Cinderella! They love the princess themed bed complete with big pink canopy and pillow. 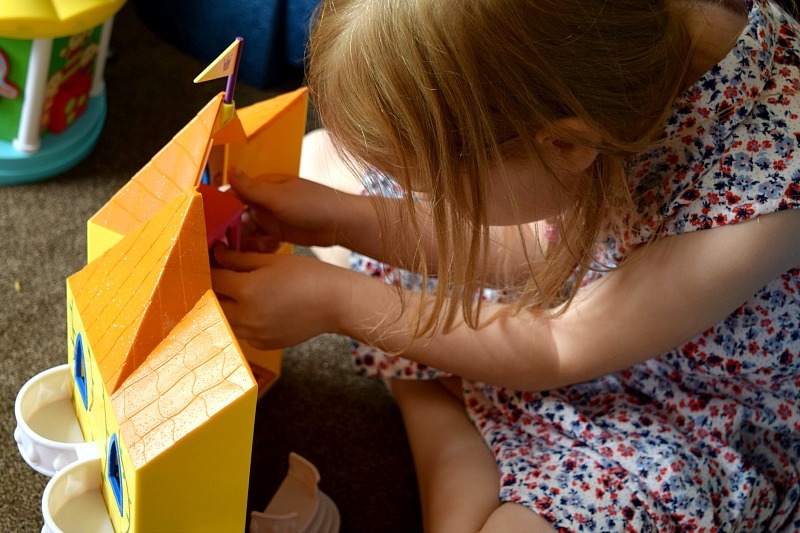 The rooms are decorated very well and it is obvious to the kids what which room is for which really helps with their imaginative play. The set is easily packed away with a little lock on the side to stop it falling open which makes it great for taking out and means they have no excuse for losing pieces! You do just get just the one figure, which is a shame as the kids have to take it in turns to play with Peppa. I am sure the fairytale range of figures would go great with this set though, I have bought a set already for Elsie's birthday this month so they will be very pleased to have a few extra characters for their stories. The play set is aimed at children aged 5+ but there are no pieces that seem too dangerous for my younger two so I would let both Zach (3) and Elsie (almost 2) play with it. It is a must-have for Peppa fans and is much better quality than I expected. It is a little on the expensive side at £24.99 so is worth shopping around to find the best price. It is available to buy at Smyths Toys now.